Per tradition, some of the folks at APL got into the costumed spirit of the season. Wanna see? For the first time this year, instead of a Halloween party, we had trick-or-treaters come into the library for a treat bag. Good reception for our first year...plus we got to see cute costumes all evening! And in the "oh god, my folks are going to see this" category...Becca and I coordinated outfits this year. 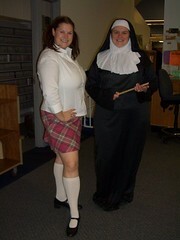 Sister Becca and naughty schoolgirl Marissa. Classic. 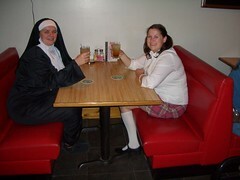 The nun and the underage schoolgirl go bar hopping after work. Classic.